Today is Flamingo Friday. Why? Because it alliterates and I love painting these beautiful pink birds. So do a lot of you. 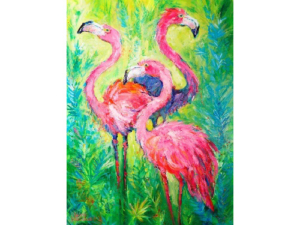 Flamingoes are a favorite motif of the people who attend paint parties at Vino’s Picasso, whether at Lovegrove Gallery & Gardens or at one of Vino’s locations in Southwest Florida. Flamingos are as rare as they are beautiful. If you’ve ever been to Busch Gardens in Tampa or the Naples Zoo, then you’ve had the pleasure of seeing a whole flock of them moving slowly about. But in all likelihood, you’ve never seen one in the wild. Not even while kayaking or hiking on a nature trail. That’s because the only place you’ll find them in the entire State of Florida is Stormwater Treatment Area 2 out in the Everglades. By the end of the 1890s, flamingoes were all but eliminated from the State of Florida as a result of feather and egg harvesting. Then, in 2014, a handful of pink flamingos was discovered in STA2, which is a 9,000 acre wetland that’s designed to remove nutrients from the water supply. It’s possible that these particular birds broke free from the captive population that’s spent the past 73 years at Hialeah Racetrack in northern Miami-Dade County. It’s also possible that they migrated up from the Bahamas or Mexico. 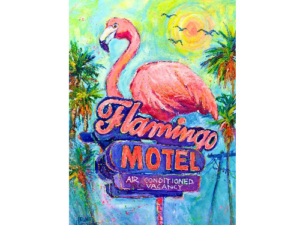 Flamingos are a favorite at the Marietta Museum of Art & Whimsy, which purchased four of my paintings this past Spring for its permanent collection. Museum founder Marietta (Mary) Lee not only has installed two 1,200-pound metal flamingos in the front of the museum, she maintains a flock of plastic flamingos (like the ones you see in people’s yards) in the museum’s lush, shady, tropical sculpture garden. Matter of fact, it’s hard to count ’em all. Mary has scattered more than 160 lawn flamingos throughout the grounds … although she’s constantly having to replenish her flock as people take them as souvenirs. 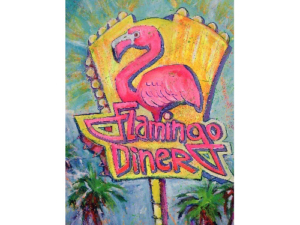 Did you know that a sculptor by the name of Don Featherstone originally created the pink flamingo lawn ornament way back in 1956. Featherstone (really, that was his name) didn’t base his deco design on a real live specimen. He used a photo in National Geographic as his inspiration. 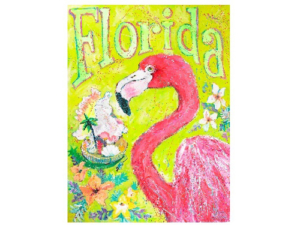 Except for a time when they were manufactured in New York, the flamingos have been produced not in Florida, but Massachusetts. Featherstone was apparently quite a character. According to his obituary, he and his wife wore matching outfits every day from the late 1970s onward that Mrs. Featherstone made by hand mainly from flamingo-patterned fabric. 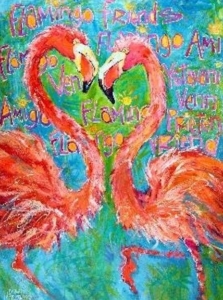 One last piece of flamingo trivia involves a practice known as “flocking.” Flocking involves secretly filling someone’s yard with a flock or flamboyance of pink flamingos to celebrate a birthday, anniversary, or for no other good reason than the fact that it’s hilarious. Believe it or not, there are even companies in business that will flock someone’s yard for you. 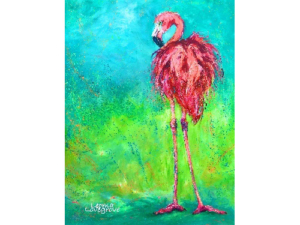 So enjoy Flamingo Friday and be sure to get your very own Lovegrove Flamingo next time you come to the gallery.